This week-end I witnessed my first live starling murmuration. It was awesome. We got to the field near Ashwicken Church, six miles from King’s Lynn, in good time and walked round, peering skywards in the chilly, late afternoon air. Would the birds come? Some local people had told me about seeing these pre-roosting activities during recent evenings, so we hoped so. 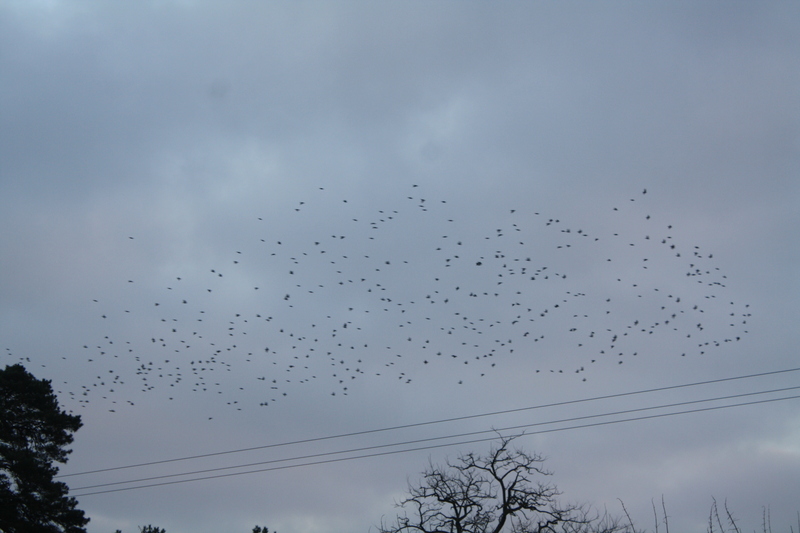 Then groups of varying numbers of starlings started flying in to the West Norfolk site from all directions. Numbers began to build in the clear, calm air on this Saturday evening.. The performance started. The choreography was masterful, breath-taking. Maybe several thousand agile birds merging, twisting, turning and reforming to our left, our right and straight ahead of us. To start with, a lot of the action was to the left, some way in the distance. Several times, we thought they’d gone down to bed, but they surged up again to carry out further manoeuvres. Then some began to filter from left to right, skimming snake-like over the tree tops in front of us. Sometimes they resembled a column of smoke, or they formed a heart or a bird shape. The birds begin to move across. It seemed, however, they had saved the best till last. For they began to fly in our direction, alongside the northern side of the church. As they came closer to us, we could hear the whooshing of their wingbeats as they thrummed forwards and back in a blackening mass. The chattering of their many voices blurred together. We could still hear them nattering together as they disappeared for the night into trees and hedges. A few smaller groups of stragglers still raced in, last-minute, eager to join the safety of the mass roost. While we were watching the finale, a small late group approaching whizzed quite low over my right shoulder, surprising me, to link in. It became jolly cold in the field, but I didn’t want to leave until I’d seen the whole show! I think it probably lasted for around 30 to 45 minutes – we didn’t stop to look at our watches! As the darkness deepened, the swirling mass of birds did finally disappear, drifting down towards land, but as we returned to our car, we could still hear the faint babble of their voices as the starlings swapped stories of their days’ activities. Their performance was as good as it looks on the television. My son, Stephen and I managed to get a selection of photographs of the action, and some of them appear in this blogpost. Why starlings carry out these gatherings is still being debated. Reasons put forward include safety in numbers as birds of prey would find it hard to pick out a single bird; warmth generated by numerous companions or swapping notes on the best feeding areas. One expert suggested that a murmuration could act as a signpost to a roost. Also, numbers of British starlings are swelled in the winter by the arrival of others from Europe. And they endeavour not to crash into each other while flying in these massive clouds by copying the movements of the six or seven birds nearest to them and by keeping the same distance apart from their neighbours. But regardless of the reasons behind it, a murmuration provides us with one of the best free shows on earth. And I don’t believe I could ever tire of watching it.